The brothers Sebastian and Lucius Gahagan were the two most prominent members of a family of sculptors active from the late 18th Century, and originating in Ireland, where the name was commonly spelt Geoghegan. Their father Lawrence Gahagan, also a sculptor, specialised in portrait busts. Sebastian Gahagan (active 1800-1835) was born in Ireland, and once in England, worked for Nollekins. 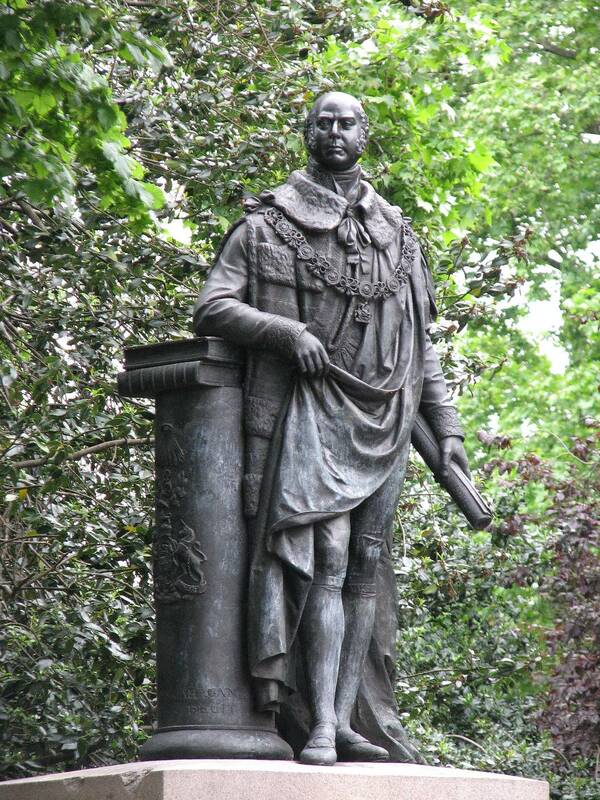 His bronze statue of the Duke of Kent (father of Queen Victoria) stands at the northern end of Portland Place in Park Crescent Gardens, London (it is shown above left). In St Paul’s Cathedral is his monument to Sir Thomas Picton, a classical group showing a bust of the deceased on a pillar (portrait shown at the Royal Academy), and beneath a lion, angel holding a wreath above it, and a Greek warrior with a male winged figure leaning on his shoulder. 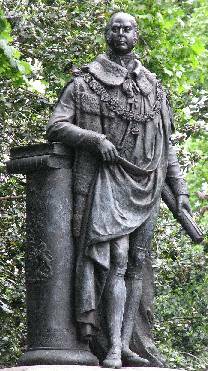 He also has one monument, to Charles Burney, in Westminster Abbey. He designed figures of Osiris and Isis in Coade Stone for the long-gone Egyptian Hall in Piccadilly. In Bath Abbey he has a figure of a girl, classically draped but bearing a shield with a cross, for the monument to Archdeacon Thomas. All his work seems highly competent in treatment of figure and drapery, if hardly inspirational. Lucius Gahagan of Bath (he settled there in about 1820; d.1866) is represented by three outdoor works in that city. Two of these are the slight statues of Commerce and Genius (above right) in niches in the frontage of 8-9 Quiet Street (a Mercury on the summit of this building appears to be by a different hand). The third is a bust of Garrick on the Garrick Hotel, St John’s Place – weathered, but with presence and a good half-smile. Small plaster busts, rather ugly, are in the collection of the Victoria art gallery, and the National Portrait Gallery holds a plaster maquette of a certain Mr Beadon.